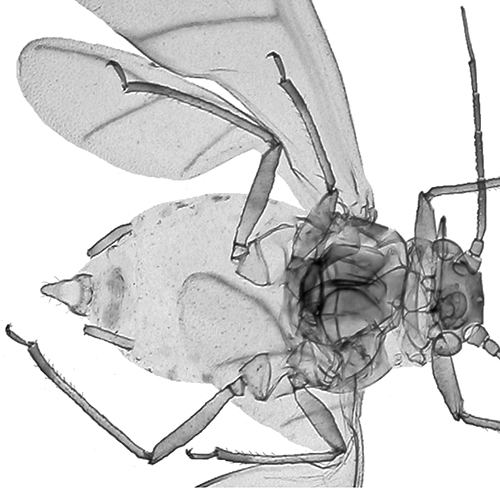 The clarified slide mounts below are of adult viviparous female Coloradoa tanacetina : wingless, and winged. 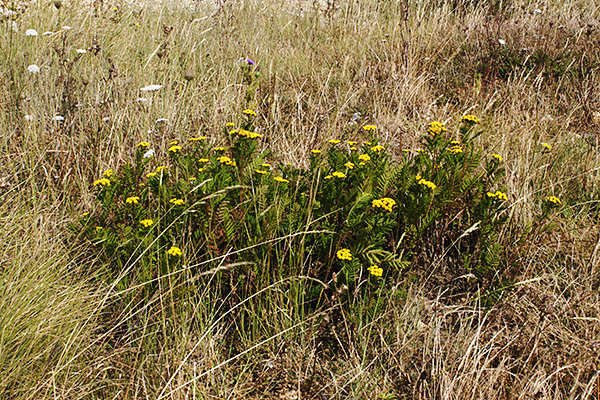 We have only found Coloradoa tanacetina once - a dense population on an isolated patch of tansy growing on the beach at Seasalter near Whitstable, Kent. As with most Coloradoa species, you are unlikely to notice this species unless you are specifically looking for it. The best way to detect the presence of a colony is to tap the leaves of tansy (Tanacetum vulgare) over your hand (see picture below), or (better) over a small tray. 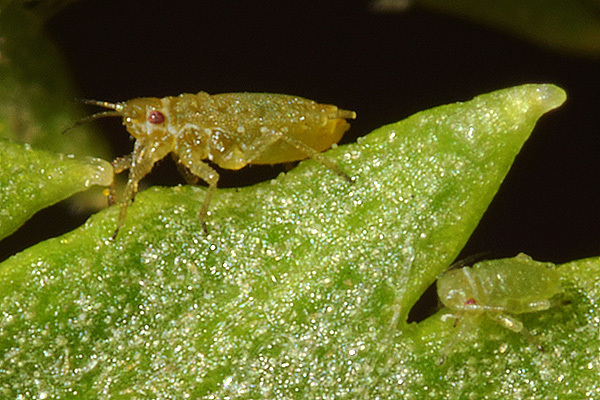 If the plant is infested, the aphids drop off readily. 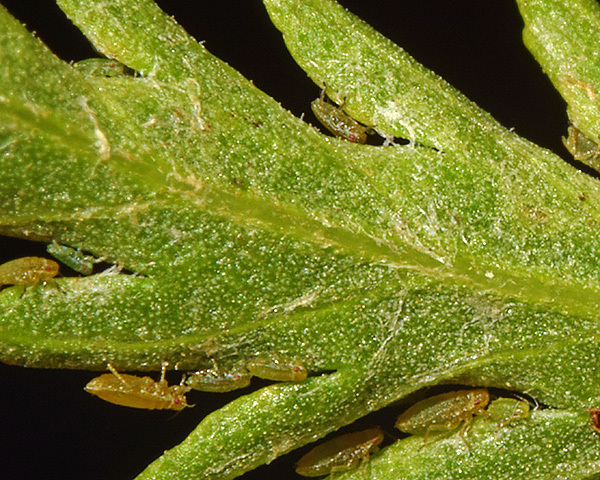 A careful search of an (un-tapped) tansy leaf should then reveal the aphids feeding on the margins of the leaves, as shown in the picture below. The leaf edge is perhaps chosen because penetration is easier at this point. Under high magnification, the flat surfaces of the leaves appear more shiny than the edges, suggesting some form of wax protection over most of the leaf. Tansy leaves and flowers are toxic to humans if consumed in large quantities due to the presence of a volatile oil containing thujone, camphor and myrtenol. 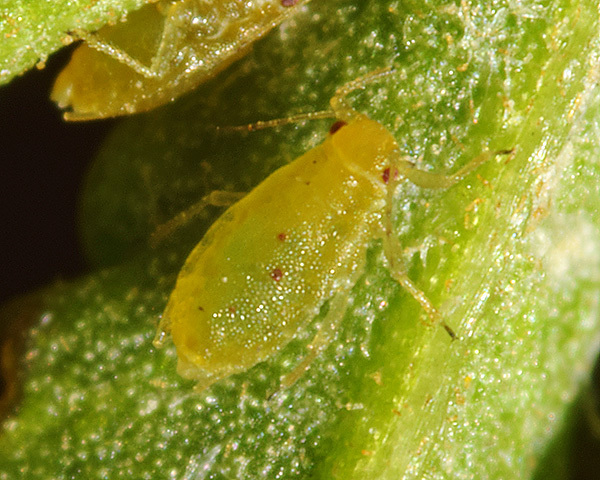 The tansy leaf margin aphid is clearly able to detoxify these toxins or sequester them where they cannot harm the aphid. The fact that the aphid is cryptically coloured suggests that the thujone is detoxified or excreted, rather than being stored and used to make the aphid distasteful to predators - as is the case with the aposematically-coloured crimson tansy aphid, Uroleucon tanaceti. Unlike several other species on tansy, Coloradoa tanacetina is not attended by ants. Woodring et al. (2004) showed that the richness of the honeydew (rate of secretion x total concentration of sugars) and the presence of the attractive sugar melizitose were the critical factors determining the extent of ant attendance of the aphids feeding on tansy. Coloradoa tanacetina has a very low rate of secretion, so the richness of the honeydew was effectively zero for this species. Despite the presence of toxins in tansy, many species of aphids can be found feeding on this plant, mostly specialising on tansy or closely related species - plus a few polyphagous species. Blackman & Eastop list 23 species of aphid as feeding on Tanacetum vulgare worldwide, and provide formal identification keys. 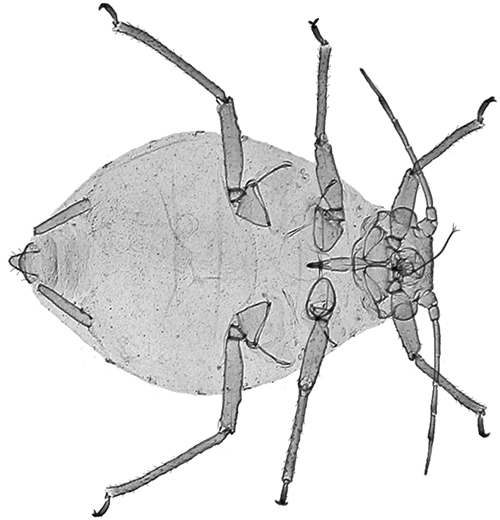 Of those aphid species, Baker (2015) lists 17 as occurring in Britain: Aphis fabae, Aphis gossypii, Aphis spiraecola, Aphis vandergooti, Aulacorthum solani, Brachycaudus cardui, Brachycaudus helichrysi, Coloradoa tanacetina, Macrosiphoniella abrotani, Macrosiphoniella millefolii, Macrosiphoniella tanacetaria, Macrosiphoniella tapuskae, Macrosiphum euphorbiae, Metopeurum fuscoviride, Pleotrichophorus glandulosus, Trama troglodytes, and Uroleucon tanaceti. Bell et al. (2015) (Appendix S2) have also published an "annotated checklist of aphids present in the UK". 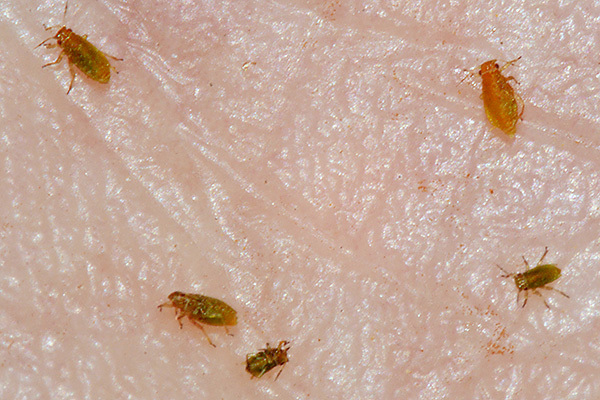 We discuss some of the reasons for the differences between Baker's and Bell's lists in our rare aphids page.